name 5 things. : The Big 6-0. My mom turned 60 this past weekend, and we wanted to celebrate her. We had about 45 or so people over at our house to help celebrate her too! My mom has so many friends and family who love her so much. Overall, we kept the decorations simple. We found this great string decoration that we zig-zagged across the living room ceiling. We also bought some fabric from Ikea and used Heat n Bond to finish the edges to make runners. I liked the idea of having them run horizontally, rather than vertically. I kept the flowers simple -- I don't think you can't go wrong with white hydrangeas. And I like low arrangements on the table so they don't block your view of the person across from you. The confetti on the table was a mix of stars and the number "60". After the party, when it was just family around, I gave my mom her gift. 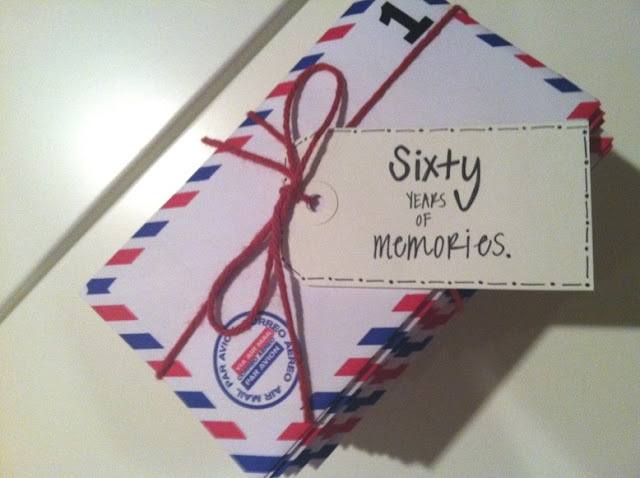 I borrowed this idea and compiled "Sixty Years of Memories" for her. It was so fun watching her read through them all. It was late and everyone was tired after the party, but it was totally worth staying up to see her reaction and laugh about some of the stories (along with her sister, brother, and mom). I already knew this about my mom, but so many of the stories had to do with her selflessness, kindness, and caring heart. My mom really is one of the most thoughtful people there is, and I'm so blessed to have her as my mom and friend. Please note my mom is totally cheating in the picture by standing on our stairs (she is slightly height-challenged). But since it was her birthday, I let her get away with it! And if I can look like my grandma does when I'm 81, I will be a happy camper. We had a fun time celebrating with her! Happy 60th, mom! Lovely post about a lovely party in a lovely home for a lovely lady. I just explained to her why I didn't end up writing a note. Hoping you are able to rest this week. It was such a wonderful party. I cannot express my thanks to my precious daughter and son-in-law for throwing me the best party ever! The sixty years of memories were so precious and I know Emily must have gone to a tremendous amount of effort in coordinating those memories - especially since the month and a half prior to my birthday are exceptionally busy months for everyone. I am so blessed to have a daughter that loves me so much (and son-in-law too). Thanks again - with all my heart. I love that idea of the sixty years of memories, I've been thinking I should do the same for my parents. Looks like a wonderful party. I thought that idea of Holly's was so sweet. It's good to know it's actually doable! I might have to ask you all the details -like how long befor eher birthday you started compiling things, etc in case I want to do it too! How nice!! I bet your mom had a fabulous time. The 60 years of memories must be the best gift ever!! Seriously, your mom and grandma look amazing!! Such a great picture of the 3 of you. Glad the party went well! Awww, sounds like it was a fabulous party. The "60 Years of Memories" idea is fantastic, but that must have taken a lot of work to organize! 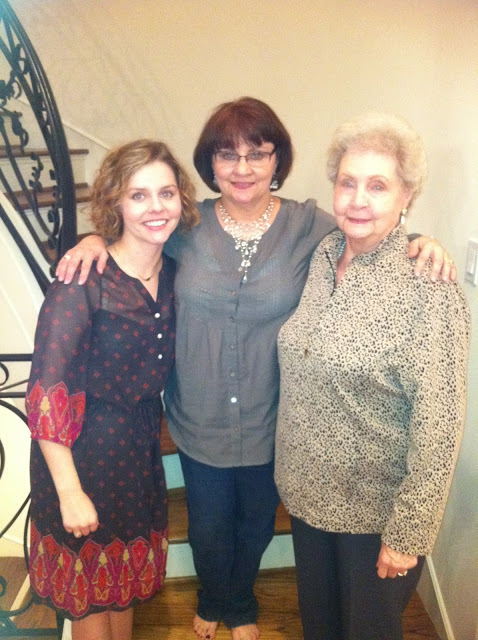 I *love* the three generation picture! What lovely ladies you have in your fam! Definitely some good genetics (c: That memories gift is so stinkin' sweet...I would be bawling my eyes out!